On day 5 of Manavala Mamunigal Uthsavam – what a dharshan it was - of Sri Parthasarathi – sublime beauty, draped in beautiful silk dress, dressed like a Cowherd King, wearing a turban, whip in his hand, the other hand resting, adorning many jewels, including impeccable shining ear rings ~ he was also wearing bangles - what a marvellous treat to His bakthas. – and it is the day of Govardhana giri Gopala. We all go to temples and worship Lord in various forms. For us the Lord is Omnipresent and the beautiful Uthsavar symbolizing Him comes on the street to provide darshan and protect us. Often we stand before the Lord and rekindle our worries beseeching His benevolence in getting remedy. There are others who visualize Him in various swaroopams and enjoy Him in their inner souls. Saint Periyazhwaar, when he saw Lord Sriman Narayana astride Garuda, started thinking of His magnificence and started singing paeans seeking that no harm ever happen to the Greatest ! Our little Sri Krishna was born in Mathura in a prison of Kamsa ~ the kingdom of Mathura was earlier known as Braj, perhaps the name derived from Vajrasan. 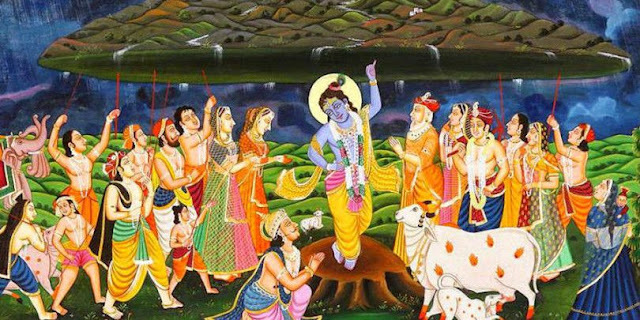 All places associated with Lord Krishna enamour us .. .. nearer Mathura, is Gokulam, Brindavan, Govardhan – the places where Krishna exhibited so many wonders and grew up along with Balarama. Today ( 20th Oct 2017 ) is the 5th day of Swami Manavaala Mamunigal Uthsavam celebrated as “Annakoota Uthsavam.” On this day, lot of Chakkarai pongal, kadambam and other such offerings are made to Perumal. This is to commemorate the lifting of ‘Govardhana Giri’ by Lord Krishna on the day when it rained very heavily when the cowherds were making offerings to Indira. Govardhana (गोवर्धन) is a 8km long hill located near the town of Vrindavan, in the Mathura district of Uttar Pradesh – it is the sacred hills of Braj. Lord Krishna as he grew up, saw preparations for the annual offering to Indra and questioned his father Nandagopala, instructed the villagers on what their dharma as farmers was. An angered Indira flooded the village. Lord Krishna protected the village people and their cattle by lifting the Govardhana hill with his little finger. 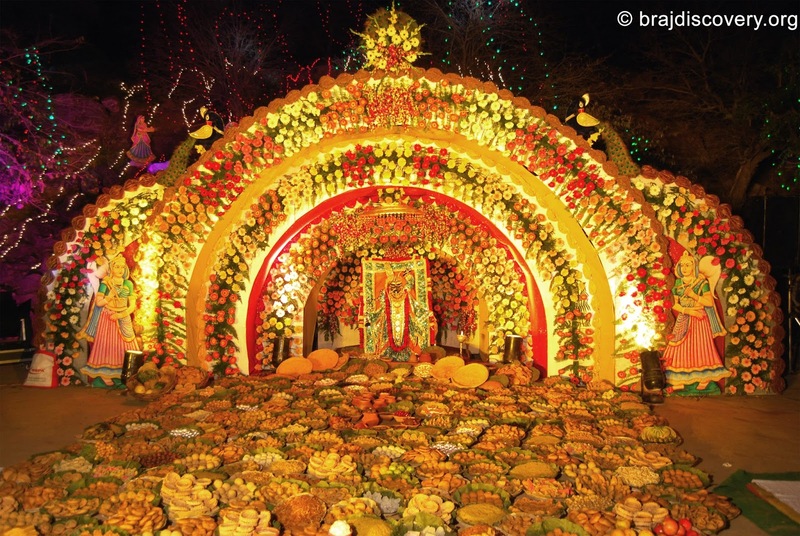 Understand that in Northern part, hundreds of sweet dishes are offered to Lord Krishna on this day. Here is a photo taken from the web of - which depicts hundreds of sweets offered on the altar in the shape of Govardhan hill. இன்று மணவாள மாமுனிகள் உத்சவம் அன்னக்கூட உத்சவம் என பிரசித்தி. இன்று பெருமாளுக்கு கதம்பம் முதலான அன்னங்கள் அமுது செய்விக்கப் படுகின்றன. 'இந்திரனுக்கு என்று ஆயர்கள் எடுத்த எழில் விழவில்’ என 'கோவர்தனகிரி' பிரபாவம் நினைவு கூறப்படுகின்றது. ஸ்ரீ பார்த்தசாரதி பெருமாள் 'ஆயர் குலத்தில்' வந்து உதித்தவராக கோல் (சாட்டை), தலைப்பாகை, தண்டம், என அணிந்து மிக அழகாக சேவை சாதித்தார். "சீலை குதம்பை ஒரு காது, ஒரு காது செந்நிற மேல் தோன்றிப் பூ" என கண்ணன் கன்றுகள் மேய்த்துவரக் கண்டு யசோதை மகிழ்ந்ததை பெரியாழ்வார் அனுபவித்த வண்ணம், ஸ்ரீபார்த்தசாரதி தனது காதுகளில் 'ஓலை மற்றும் பூ' போன்ற திருவாபரணங்களை அணிந்து கொண்டு அழகான பட்டு உடுத்தி, கைகளில் வளைகள் அணிந்து சேவை சாதித்தது நம் போன்றோர்க்கு கிடைத்தற்கரியது.